The Iowa Initiative for Sustainable Communities (IISC) at the University of Iowa is proud to announce Webster City as its next community partner. Webster City’s resilience and grass-roots recovery initiatives inspired the IISC advisory board to choose their community for IISC’s engaged-learning partnership that will bring 150 or more university students, faculty, and staff to work alongside Webster City officials and community members on 10-15 projects during the 2018-19 academic year. 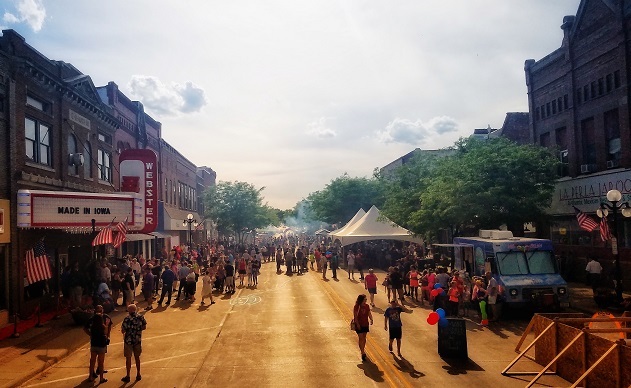 Webster City was selected in a competitive process from a pool of community applicants from across Iowa. The Iowa Initiative for Sustainable Communities is a campus-wide, engaged learning program housed in the Provost’s Office of Outreach & Engagement at the University of Iowa. The IISC pursues a dual mission of enhancing quality of life in Iowa while transforming teaching and learning at the university. IISC is currently completing two-year partnerships in Mason City and with the East Central Intergovernmental Association (ECIA), which spans Cedar, Clinton, Delaware, Dubuque, and Jackson counties. In the 2016-17 academic year, IISC completed 22 projects with 23 community partners and involved 123 students, faculty, and staff from the UI. Some projects are already being implemented, including the Pearl Street Park project in Sioux City, which leveraged $500,000 in private investment to complete plans developed through the IISC partnership. To view past partnerships and projects visit http://iisc.uiowa.edu.